I volunteered to do a demo in the hallway at the Art Gallery of Burlington during the Christmas Show and Sale. The idea being to let the public see an artist at work. I have only done a handful of portraits in oils and since I am no longer allowed to use my walnut oil based M Graham paints in the gallery I purchased four tubes of Winsor and Newton oil paint (Anders Zorn palette). Unfortunately I mistakenly picked up a tube of very cool transparent yellow instead of a nice warm cad yellow. I always do portraits from a sitting model but since there wasn't room I decided to do a portrait of a friend from a very bad black and white photo so that I wouldn't be tempted to become a slave to the two dimensional photograph. After all I know what this friend should look like. I kind of forgot that this experiment would be done while answering questions and chatting with dozens of people walking by me in the hallway. The portrait is terrible but it was a fun experiment. I chopped off the back of his head and I made his ear much bigger than it really is but with those issues fixed and a warmer yellow this wouldn't be all that bad. On a brighter note I am happy with the next two portraits. I have been offered the chance to do a solo show in St James Church in April and Debbie thinks that I should hang my sketches. I certainly have enough of them so I think that I may do that. Etienne and Joanette were as usual great models so these were just plain fun to do. I do need to work on my photographic skills too. These are about 20" by 16" and look much better in real life. The normal highs for this time of year are 8 C if we are lucky. Today it was 23 C and sunny. I painted for two hours in a tee shirt and then came home and fell asleep in a lawn chair in our yard. To top it off I have a painting that I actually kind of like. This is looking downstream from one of the bridges in Lowville Park. Most of the leaves are on the ground but there were some oak trees making a perfect backdrop for an old maple with no leaves. The oaks reflected off the water in the still part of the creek turned the water a very rich brown. There was just enough of a breeze to create movement in the dry leaves. I love my job but on days like this I feel especially blessed. I almost didn't go to the sketch group today but I had to drop a painting off for the Art Gallery of Burlington "Small is Beautiful" show so I decided to stay for the sketch group. Why is it that when I am not really in the mood that I do some of my best work. I have sketched Cassandra many times but today I think that I got my best likeness yet. Maybe I should only paint when I am looking for other things to do. Yesterday was another perfect day to paint. A clear blue sky and warm enough to paint comfortably without gloves. The fall colour is well past its peak but the colour that is left stands out against the grey background and the orangish yellow leaves were brilliant against the bright blue sky. I should have made the sky more blue however I wanted a smooth even hue for the cloudless sky and was concerned that I would end up with too much texture if I went back in. Bernie has posed many times for our Wednesday morning sketch group and he is always fun to sketch. He is a wonderful old gentleman who has a really craggy face and always looks miserable. One would think that getting a likeness of a face with this much character would be easier than a plain face that looks like everyone else but I don't find that to be the case. If you have a person with a very average face all you have to do is get the shapes relatively right and it looks like them. It looks like a lot of other people too but it looks like them. With a face like Bernie's you have to get all the odd shapes and nooks and crannies correct or it looks nothing like him. I like this sketch but it doesn't look like Bernie or at least it doesn't look the way I feel Bernie should look. Yesterday was as close to a perfect day as it gets. I went out and voted in the morning, painted in shirtsleeves in the sunny afternoon, had a wonderful turkey supper with Debbie, watched the Toronto Blue Jays beat the Kansas City Royals and then watched the very divisive Conservative party get removed from power. I love being Canadian. 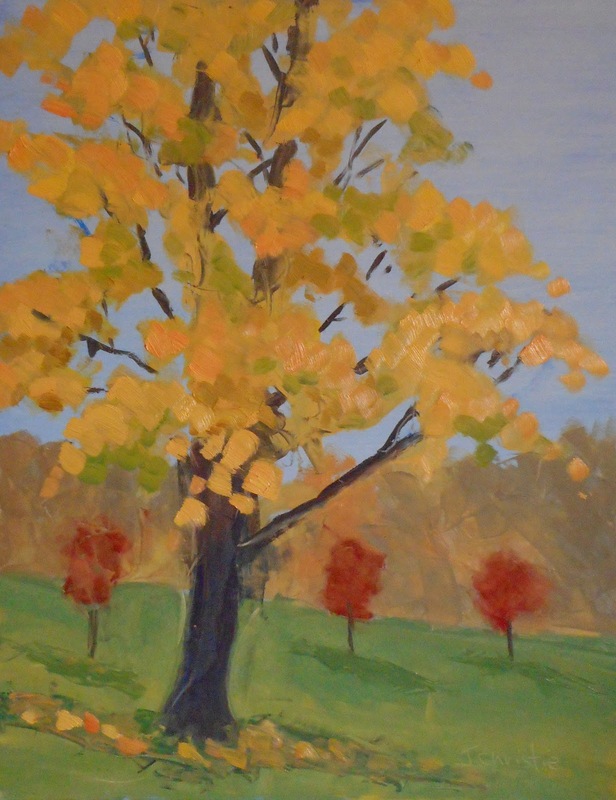 About a dozen of us gathered at Hidden Valley Park in Burlington to paint fall colours. The colour was past its peak and not all that impressive however it was sunny and very warm so a great October day to paint. This pine tree seemed to be dancing in the park and I thought that it could be a very dramatic composition. I always start a painting by putting a thin layer of a mood setting colour (in this case cadmium red light mixed with transparent iron oxide) on my board using oil paint. I then wipe out the highlights and add some darks to get a sense form. This under painting usually gets almost completely covered with more paint however in this case when the painting was complete except for the sky four different artists (all of whom I respect) came by and told me that they loved the sky so guess what. No blue sky. I kind of like it. What do you think? We painted at Kerncliff Park in Burlington on Thursday. It is one of my favourite painting locations at any time but in the fall it is especially grand. The colour in this old quarry is magnificent and I have failed at every attempt to paint it. This one is my best to date probably because it is so much fun to let the colourist in me loose. I spent the week before Thanksgiving paddling in Algonquin Park with my son Nathan and five of his friends. The very generous deal was that I was exempt from chores provided I painted. I again failed rather miserably with acrylic paint but I am getting a better feel for how it works so I will keep at it. You can play with oils but acrylics dry way too fast for my liking. I used some retarder this time and that helped. This is the best of the three completed paintings. I did a few watercolour sketches along the way and this one is of our mascot "Trojan" who is a rubber chicken that showed up in the oddest places during the trip. The Monday Painters were invited to spend two Monday afternoons on Manorun Organic Farm in Copetown. This is an organic co-op and a great example of sustainable farming. They are a family farm with interns helping and learning. Everyone was smiling and friendly. Add to that the fact that I could paint here every day for a month and not run out of subject matter and I was as happy as a farm pig in its pen. They had a big and very old silo that I think was made from ceramic blocks. We didn't go in it but one of the interns is calling it home. I became a bit fixated on it because it was so unusual and ended up painting it both weeks. This first painting was done from very close to the car in the shade of a huge willow tree. I discovered that if I hiked down the farm lane a bit, climbed a rather steep embankment and avoided the electric fence I could stand in knee deep grass and get a view of the entrance to the silo/guest house. I lost my coffee mug in the grass somewhere but it was rather worth it. One would think that being inspired would make things easier however I find that it often means I get frustrated and overwork my painting. There is simply too much pressure to get it right. That happened with both of these to a certain extent. I am happy with both of them more because of the wonderful memories than because they are great paintings. I have been painting lots but not posting much. Here are a couple of my latest efforts. This first painting was painted from the top of Rattlesnake Point. It was a fantastic day with fish scale clouds and no haze. Perfect for this kind of vista. I have never painted here before but I will be back. My goal with this painting was to capture the perspective. We are a long way up and can see forever. I have been sketching more. These watercolour and ink sketches are just plain fun to do. The first one is of an artist friend at one of our paint outs. The second one is of the Rails End Gallery in Haliburton. 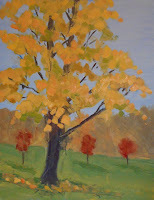 I had two paintings in an invitational plein air show there and Debbie and I drove up there to retrieve them. Nothing breaks up seven hours on the road like half an hour sketching. Debbie and I are driving to British Columbia this summer so I can see some paintings and a ton of sketches in my future. I love painting outside when there is snow and this winter is driving me to distraction. All this snow for so long and it is too cold to paint outdoors. I switched to oils because watercolours froze and this winter it has been so cold that oil paint gets to be about the consistency of play-do. The up side is that I am spending more time working on portraits. Last week in class I did a pastel sketch of Kim so this week I took my oils. I have been struggling with pigment selection and getting the forms correct so I decided to work the same way as I do for landscapes. I toned the whole panel with yellow ocher and then added some darks and rubbed off the lights until I had a decent value study. I then started adding colour. This still has a long way to go but I am excited about the start. The background, her hair, eyebrows shirt etc. are all still the under painting. I need to get outside. I am actually debating painting the view from my studio window. Yikes! We had a wonderful model for our sketch group today. Zoe is the granddaughter of an artist friend and she did a great job of posing for us. She is a talented young lady who writes and sings her own songs. She posed with her guitar which caused some artists a lot of grief but since I only do head and shoulder portraits is wasn't an issue for me. There are a couple of problems with this and the digital image isn't great but Zoe was a pleasure to do. What a winter. All this glorious snow and I have either been too sick or it has been too cold to stand at my easel. We just spent three days in Ottawa and it was -25 almost the whole time. I was looking forward to painting in the Ottawa area but needless to say I didn't. I have been struggling with portraits in oils so for Katherine's class today I decided to take my pastel pencils and sketch. Kim is a great model with wonderful features and it was a treat to just relax and draw. I am happy with this. I kept it loose and managed a decent likeness. Next Tuesday I plan on staying for both the morning and afternoon sessions to do the same pose in oils. I can't wait. I am still struggling with my muse. On Monday I played with Anders Zorn's limited palette and did a quick sketch that I was quite pleased with. Yesterday I excitedly took that same palette to a portrait class and froze up. It was a horrendous struggle for three hours. Today I felt a little skittish as I arrived at our sketch group. Kelly is a wonderful model but I had a terrible start with my pastel pencils. After much erasing and fiddling I managed to turn it around and finished with a sketch that I quite like. A good start seems to be the kiss of death for me. This is me playing around. It is a "selfie" my way. I registered for Brian Smith's workshop in March and I was intrigued by the Anders Zorn palette that he uses for the workshop. I started with a neutral grey panel and used only three colours plus white for the painting. I was using a small mirror and I was only fooling around so I didn't draw at all. I just started painting shapes and I ended up here about twenty minutes later. I will definitely play with this palette some more. It isn't perfect but it sure was fun. Bernie was the model for today's sketch group. I always enjoy painting him because he has a lot of character in his face and he sits dead still. This first head and shoulder took me a bit over an hour to complete. I don't seem to be getting much better at these but I am happy with it because I am getting to this stage much more quickly. This second three quarter view was done in under an hour. I was already pretty tired from the first drawing so I am pleased with this one too. My drawing skills are definitely improving with these sessions. If I am using pastel pencils am I drawing or painting? After painting up north I was really revved up and eager to get painting. At least I thought that I was. It has been one long struggle ever since we got home. Nothing has worked and I am too embarrassed to post any of it. Yesterday I went out with the Monday painters because I was committed but I didn't expect it to go well. I think that it did go quite well but I got too cold to finish this painting. The pathway needs work, the snow is too light and I didn't get to the roofs which are much too dark and flat but I was working loose and free which is a great improvement. think that this is finished after 5 hours of work. Jeff is a great model and Katherine McDonald is a great instructor. I need to sort out a portrait palette because I am struggling with flesh tones with my landscape pigments.